One of my favorite TV shows growing up was Disney's TaleSpin which aired on The Disney Afternoon from 1990 until 1994 and lasted 65 episodes. It starred Baloo from The Jungle Book as a cargo pilot. I wanted to get everything TaleSpin growing up and I did pretty good. The one thing I was disappointed in was the Nintendo game. I could never get past the third stage and overall the whole game was frustrating. I still own it but it's one that I would never play even if my Nintendo was still hooked up. This screen is my nightmare. In something a little different, here is a video of a TaleSpin game I can actually beat. The TaleSpin Tiger Electronics Handheld Game. During the 1990s, Tiger Electronics made possibly hundreds of handheld games that basically worked like a calculator. They had static images that lit up at certain times to simulate movement. Some were better configured than others and I do think TaleSpin falls into that category. 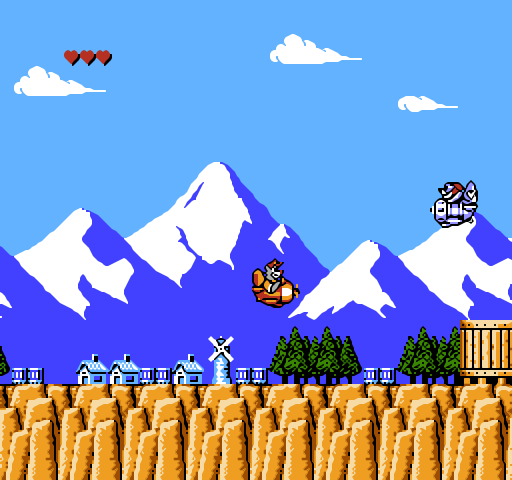 You can only move up and down in order to dodge the Air Pirates, mountains, and lightening. If you start running out of gas or obtain too much damage, you can hit a button to refuel or repair. There are four stages that take about 8 minutes to complete. You can continue playing but who would want to? Please pardon the guerrilla-like recording and I would recommend turning off the sound after you get a little taste of it because it is repetitive and very annoying.